This recipe makes 30 cupcakes. It’s a lot of steps for this delicious cupcake, but in the end, you’ll be happy to enjoy these special heavenly morsels. First I begin the apple filling. 2 granny smith apples peeled and chopped into bite size. Mix until all the apples are covered with all of the ingredients in the bowl. Let your apple filling mixture relax (macerate) for a good 10 to 20 minutes. Then place the mixture in a small saucepan on medium high heat. Let the mixture come to a simmer. This should take about 4 minutes. Stir in completely and then turn off the heat. Let your mixture cool down. While that is happening, begin working on your cheesecake filling. 1 cup of white chocolate nebs chopped out of their shape. You want pieces that can blend into your next mixture. Mix until your cheese mixture is smooth. Next it’s time for the cupcake batter. Now line your cupcake baking pan with paper cupcake holders. Pour your cupcake batter ½ full. Spoon in 2 tablespoons of apple filling with its juices. Spoon in 1 heaping tablespoon of the cheese mixture on top. Spread the top of the cheese mixture out so it covers the entire top of the cupcakes. Don’t over pack these. 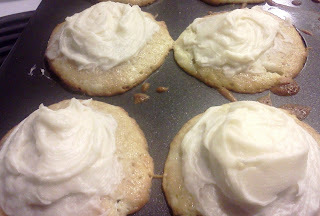 Your cupcakes should be a few centimeters shorter than the rim of your baking pan. These rise quite a bit in the oven. Preheat your oven at 350 degrees. 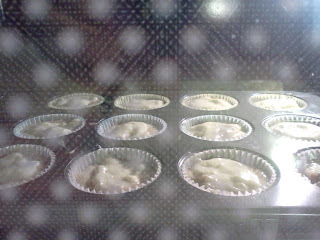 Then let your cupcakes bake for 20 minutes. It usually bakes exactly for 20 minutes, but do keep an eye on it in case your oven bakes faster than mine. Let them cool for 20 minutes before eating.